Okay, here is another idea about letting Spin Master know what you think- become a field-tester for many products, including Bakugan through Field Source, http://www.fieldsource.ca/index.html. You can join their panel and have the chance to share your opinion and try out new merchandise. Free products and compensation for your opinion is a real possibility, too. You don’t have to be over the age of 18 either (but if you are under 16, you do have to get your parents’ permission). To join the panel, fill out the short survey (it takes about 2 minutes) and wait for them to contact you. Okay, stumbled on this blog earlier today. Maybe you have heard about it already, but if not, check out the free giveaways they have several times each month. They give away a lot of Spin Master stuff. The May 4th contest included Bakugan. Best of all, entering is easy. Fairly simple! Visit http://toyxplosion.com/ and leave a comment at one of the giveaways that's still open- that's it! What if you could be a “product tester” for Spin Master? What would you change about Bakugan, if anything? How would you make the products better? Would you add new features or make up new rules to the game? How might you change the way they market Bakugan? Maybe you even have a new idea for a marble or a spin-off series. Okay, he’s just a little guy, but what a great job anyway. He is the first to try out the new products, he gets to keep the duplicates, and many of the new toys are donated to his local children’s hospital. So, here’s your chance to share your new ideas with Spin Master. It’s buried a little deep, but you can submit your inventions to Spin Master through the website. You do have to be over the age 18 to submit, so if you’re not, get an adult to help out. Visit the Spin Master website, www.spinmaster.com. Select Company at the top of the page. Under About Us choose Company Contacts. In this pop-up scroll down until you see Inventors. Just follow that link until you get to the submission form. Read the fine print- there’s not much- and submit your idea. The idea doesn’t even have to be a new Bakugan idea. Maybe you have something completely different in mind. Never know where it might lead! Bakugan Buzz Wishes You a Merry Christmas! And we here at Bakugan Buzz would like to wish you all a very Merry Christmas and a prosperous New Year! I hope you guys got what you wished for this Christmas after you shared your Christmas Wish List. Let's all relax and enjoy the holidays! Take care, all of you, and have fun with your family and friends! Here are the awesome prizes that will be given away to the winners of the BakuCon NYC regional and national tournaments on February 20th and 21st! 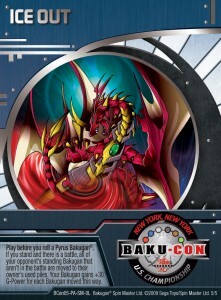 And let's not forget that all participating brawlers will be getting the exclusive BakuCon NYC Ability Card!